Walking is the easiest and cheapest ways for losing weight. All you need is a high level of motivation and a good pair of shoes. It is recommended to do at least 30 minutes of brisk walking on most days of the week. You don't need to do it in one session. You can divide the time into three 10 minutes periods. Walking is the most recommended exercise for people with obesity or overweight. There are many reasons for that. It helps burns calories and is a good way to reduce your body weight. It is the easiest exercise. Brisk walking for 30 minutes will burn 150 - 200 calories. It can be done by most people, irrespective of their fitness levels. It is safer than other types of exercises. No training is needed. Everybody knows how to walk. No special equipment needed. However, using a pedometer to count your steps is highly recommended. Set a goal of 10000 steps a day. A pedometer is a good motivation tool that helps you adapt to an exercise routine. Walking is cheap. Even you can save money by walking short distances rather than using a car. It is relaxing. It is a great way to reduce your stress. It is good for your heart. Brisk walking is the best exercise for your heart. It raises the heart rate when you walk and increase your exercise tolerance. It is an opportunity to breath fresh air. Walking outdoor is better than using a treadmill inside your house. It helps reduce your blood pressure. It will increase your good cholesterol (HDL) levels. Increased good cholesterol level is good for your heart. It helps keep you bones, joints, and muscles strong and healthy. Good posture while walking is important. It makes you comfortable during the walk and helps prevent back pain. Here are some tips to develop a good walking habit. Keep your back straight. Do not bend your back. Avoid leaning forward or backward. Don't look down under your feet. Keep your eyes looking straight ahead to about 20 feet. Close your hands partially. Don't make a tight fist. Bend your elbows to about 90 degrees. Swing your arms freely in that position. Make small steps rather than taking longer steps. Keep in mind that the best exercise to prevent obesity is brisk walking every day. 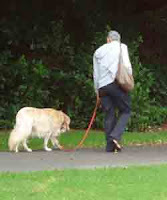 You can walk alone or walk with your dog. Joining a walking club is a good idea. It will motivate you a lot. Walking reduces your body weight not only by burning calories but also by reducing your stress. If you have too much stress, you will become obese. The stress hormone will make you eat more.